Goal is to develop personalized therapies for tens of millions of people with the two most common kidney diseases. 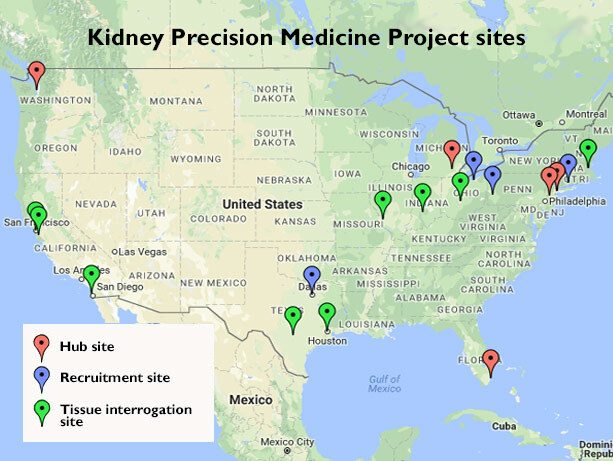 Eighteen U.S. academic medical centers have roles in the Kidney Precision Medicine Project. The Kidney Research Institute, a collaboration of UW Medicine and Northwest Kidney Centers in Seattle, has a major role in an ambitious, newly funded effort to care more precisely for the tens of millions of Americans who have chronic kidney disease or acute kidney injury. The National Institute of Diabetes and Digestive and Kidney Diseases (NIDDK) is launching the “Kidney Precision Medicine Project,” a five-year effort that spans 18 sites across the United States. The NIDDK is one of the National Institutes of Health. “The goal is to transform the way we think about diagnose and treat the most common kidney diseases,” said Dr. Jonathan Himmelfarb, who heads the Kidney Research Institute and is a professor of medicine at the University of Washington School of Medicine. “We’re a hub because we have the infrastructure to support big science and team science,” Himmelfarb said of the Kidney Research Institute. Chronic kidney disease affects more than 30 million Americans, according to the Centers for Disease Control and Prevention. Diabetes and high blood pressure are common causes. With the condition, a person’s kidneys cannot adequately filter blood, causing wastes to accumulate in the body and increasing risk for heart attack, stroke and heart disease. Acute kidney is a rapid deterioration of kidney function stemming from conditions such as blood loss, sepsis, dehydration, damage from medications, or as a complication of another serious illness. It commonly affects patients who have been hospitalized and who are elderly, or are in the intensive care unit. No effective treatment exists. Six sites will recruit people with acute kidney injury or chronic kidney disease to be in the study and submit biopsy samples. Ten sites will develop ways to scrutinize, or interrogate, human kidney tissue. Four “central hub” sites will collect, coordinate, analyze and visualize the data and samples and administratively support the project. The central hub comprises the Kidney Research Institute, the University of Michigan, the Icahn School of Medicine at Mount Sinai (New York), and the University of Miami. The effort involves UW Medicine researchers in nephrology, pathology, information technology and bioethics, as well as the UW School of Public Health. The hub sites’ award, collectively, is $19.3 million over five years, of which about $13.7 million will stay in Seattle. Central to the project is the creation of an online atlas of patients’ biopsy samples that will extensively characterize kidney anatomy. “This will be a three-dimensional, spatial architecture of the different cells in the kidney, down to the molecular level,” Himmelfarb said. “We’ll map that structure onto kidney physiology and function as well as phenotype – what we observe in the patient’s condition. It will give us a continuously evolving understanding of how the kidney functions, in health and disease.